Quang Ninh Province, home to Vietnam’s famous natural wonder Ha Long Bay, has seen a significant increase in the number of visitors, and is now striving to reach its goal of 12 million visitors in 2018. The province is located along the northeastern coast of Vietnam, around 150 kilometers from the country’s capital Hanoi, and is well known for its breathtaking natural wonders, especially Ha Long Bay, which was acknowledged as a UNESCO World Heritage Site in 1994. Located in the Gulf of Tonkin, the bay includes over 1,600 islands and islets in a variety of shapes and sizes. According to the Vietnam News Agency, Quang Ninh welcomed over 8.4 million visitors in the first seven months of 2018, up 26 percent year-on-year. Among the tourists, international ones made up more than 2.8 million, a surge of 17 percent compared to last year. The first seven months generated revenue of VND14 trillion (US$601 million), a 30 percent rise. The number of visitors to Quang Ninh increased significantly thanks to various activities going on as part of National Tourism Year 2018, as well as new regulations and strict management guaranteeing sustainable tourism development, including reducing effects on the environment, keeping the tourist sites clean and preventing chaos. July alone accounted for VND1.7 trillion ($73 million), with 916,000 visitors despite the unfavorable weather. Throughout this month the province conducted many activities to promote its tourism, including working with ASEAN Tourism Forum ATF 2019, as well as sending officials to Taiwan to introduce, advertise and promote tourist packages, potentialities and specialties. The international terminal of Quang Ninh airport has successfully completed the first test flight, and is expected to be opened to the public at the end of 2018, making it convenient for international tourists to visit. Nguyen Duc Long, chairman of the Quanh Ninh People’s Committee, has recently decided on the dates for completing and launching the Bach Dang Bridge and Ha Long-Hai Phong Highway to be September 2. Both of these infastructural projects are meant to bring many tourists to Ha Long, the capital of Quang Ninh, as well as other areas in the province. Moreover, people in this area have been making significant efforts to turn it into a tourist-friendly place. Many have seen lost and found objects being returned and support for tourists who were left in Ha Long after being conned by the operators of “fake” tours booked online. 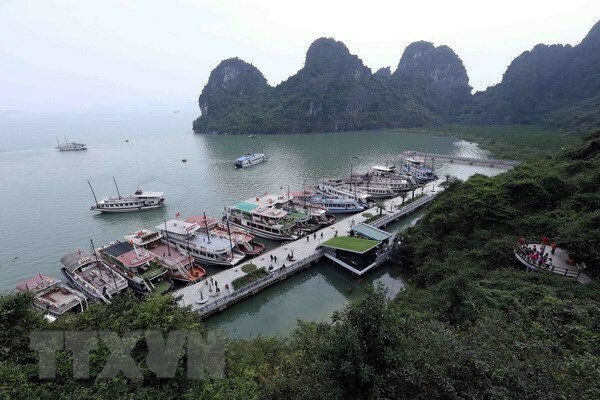 With these changes, Quang Ninh officials believe that achieving the goal of 12 million visitors will not be impossible this year.